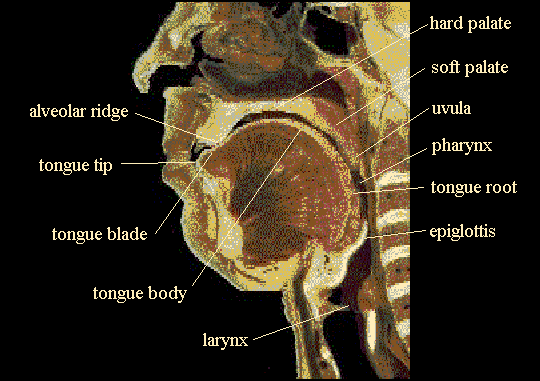 The following diagram shows the basic structure of the vocal tract that will be important in how sounds are made. In addition to their normal names, many of the parts of the vocal tract have fancy names derived from Latin and Greek. The adjectives we use to describe sounds made with each part are usually based on the Latin/Greek name. In phonetics, the terms velum, pharynx, larynx, and dorsum are used as often or more often than the simpler names.